We began this morning with learning about the whole person development that Back2Back ministries focuses on. Although we will only be joining Back2Back for a short time, it is so encouraging to know that the people we serve have been and will continue to be served even after we leave. Afterwards, we began our journey to a rural neighborhood, stopping along the way at a 7-11 to pick up some authentic Mexican snacks. Today we were joined by one of the Back2Back staff member’s nine year old son, and we all had a blast with him as he joined us in ministry and later helped show us the ropes of his country. When we arrived at the neighborhood, we began at our home base for the day, a church run by a pastor named Victor. He greeted us with a testimony that really proved the power of the Lord. Long story short, there was a time in his life when he was in prison and God, through his remarkable grace, brought him through his darkness and into the light – later starting a church. We went around the poverty-stricken neighborhood and asked people to come see the drama and songs we prepared for them. Some saw poverty for the first time, while others were reminded of how fortunate, and sometimes ungrateful we are. We then performed songs and skits. We then played games and did crafts with the kids. For dinner we had the opportunity to go to an open-air market with delicious authentic Mexican food. Reflecting on our day, team members noticed a joy that kids have, that can diminish with age. It reminded us to see the joy in life and that God truly is good. There is nothing like the love of Christ. 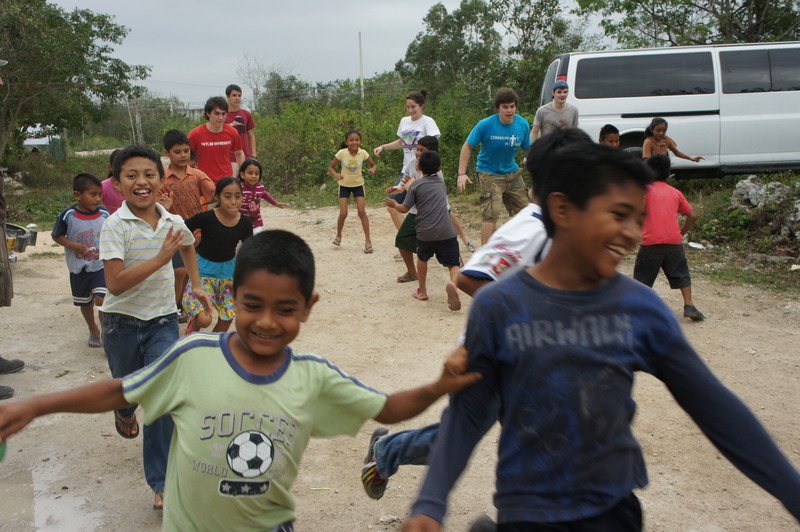 One team member has also noticed the giving spirit of the Mexican people, even though they have so little to give. If you say that something they have is nice, they are not hesitant to offer it to you. This stuck out to her because, as Americans, we tend to be possessive of our belongings, even though we have so much. We have more to give and less to offer, while they have less to give and more to offer. It made us realize we need a reality check. Overall, we are so grateful for our time here and the continued unity our team has had – laughing together, eating together, praying together, singing together, and most of all, coming together for the common purpose of Christ. What more could we ask for? Please continue to pray for health, safety, strength, and the openness of the hearts of those we will be ministering to. This entry was posted in General, Mexico 2013, Spring Break 2013. Bookmark the permalink.